This is fully discussed at the Best of New Orleans website (content duplicated below). The article mentions that the original statue has been relocated to the Ben Franklin High School, where the incoming principal, Patrick Widhalm, can be relied on to send us a picture as he relocates to the Big Easy. caption: This statue of Benjamin Franklin at Lafayette Square was a gift to the city from a Chicago resident who spent winters in New Orleans. 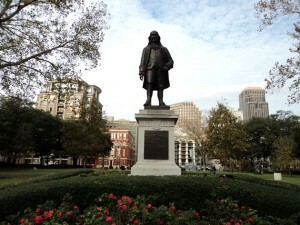 Why does New Orleans have a statue of Benjamin Franklin? Why did Henry Wadsworth Gustine dedicate a statue of Benjamin Franklin to the people of the Big Easy? Based on the quotes he elected to include on the plaque, it seems he was throwing some solid bronze shade at our laissez-faire lifestyle. The statue of Benjamin Franklin that caught your eye sits on the Camp Street side of Lafayette Square in New Orleans’ Central Business District. While it is a handsome statue of the founding father, it seems out of place because Franklin had no direct connection to our city. The statue of which you write actually is the second Franklin one to be placed in that spot. The first was erected in the center of the square in 1873 and was moved to a different spot in the park in 1900. It was replaced by a statue of Henry Clay that had been moved to Lafayette Square from Canal Street. Because of deterioration caused by the weather, Franklin’s statue was removed from the park altogether in 1909 and relocated first to the public library and later to Benjamin Franklin High School. The second statue — the one that stands in Lafayette Square now — was a gift of Henry Wadsworth Gustine of Chicago, who spent winters in New Orleans during his retirement and always visited the Franklin statue. When the statue was removed, Gustine raised the money to create a new one, an exact replica of one in Chicago’s Lincoln Park. The new statue was unveiled on Oct. 20, 1926, which also was Gustine’s 89th birthday. He died the next year.